Our title seems obvious. We all know that the U.S. dollar tends to be negatively correlated with commodity prices. This is true in the short-term but not always so over the long-term. The U.S. Dollar Index is currently nearing 83. It’s at the same level it was in 2007 when gold was trading in the $600s and the CCI (currently 554) was trading near 400. The U.S. Dollar Index is near the same level it was at the end of 2005 when gold was trading below $400 and the CCI was trading below 300. This tells us that the bull market in precious and hard assets goes way beyond simple U.S. dollar weakness. It is driven by long-term supply and demand dynamics as well as rampant monetary inflation from global parties and not just the USA. Throughout this bull market, key advances and turning points have originated from strength against foreign currencies and then sustained strength amid textbook U.S. dollar weakness. First let’s take a look at gold priced in U.S. dollars and then gold priced against the inverse of the U.S. dollar (a foreign currency basket represented by the ETF UDN). Note that Gold/UDN is often a leading indicator for Gold in U.S. dollars. Gold/UND bottomed in the summer of 2008 and made a higher low in October, when Gold bottomed. Gold/UDN broke to new highs in early 2009 while Gold didn’t break to new highs until September 2009. 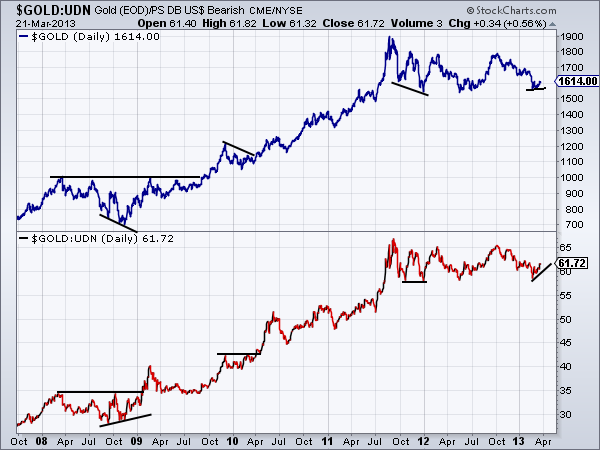 The same happened in early 2010 as Gold/UDN brokeout first. At present, there are no major divergences but Gold/UDN has been quite a bit stronger than Gold in recent weeks. Gold "needs to break above $1,620 for momentum"